The Soinsee lies in a deep basin-shaped valley formed by glacier ice. It is separated from the Spitzingsee by the Rotwand. This beautiful mountain lake, which has an area of around five hectares, can only be reached on foot: there is neither a public road nor a cable-car to this remote spot. From the edge of the basin, only a small section of the shimmering dark-green surface with its ring of massive boulders is visible. 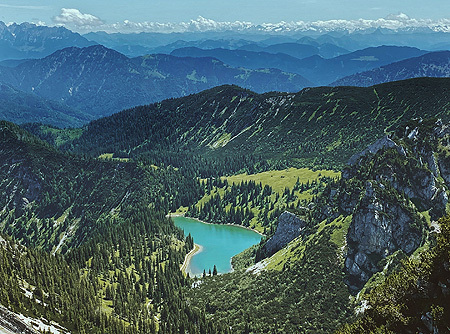 To see the bizarre reflection of the lofty Ruchenköpfe and the alpine pastures with their scattered groups of spruce trees you have to walk further down. The lake is a mere twelve metres deep and frozen six to eight months of the year. The Soinsee is located east of the Spitzingsee near the Rotwand and can only be reached on foot from Bayrischzell or Spitzingsee.